As noted, last night's WWE RAW saw Becky Lynch, SmackDown Women's Champion Charlotte Flair and RAW Women's Champion Ronda Rousey do an arrest angle where all three of them were arrested, taken to a local precinct and then released ahead of their WrestleMania 35 "Winner Takes All" main event on Sunday. The three were "arrested" after putting hands on security guards and police officers during a brawl. 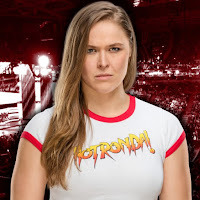 As seen below, Rousey took to Instagram and shared a mugshot photo that looks eerily similar to Becky Lynch’s back when she got arrested in Atlanta some weeks back. She wrote, "Just got out of jail, and all I got was this same lame mugshot @beckylynchwwe got from Atlanta"